The final ABY: Here comes 2013! If I could add anything to this, it would be: An entire kit is pretty inclusive, so I would just say have a bag in your car that has what you need if find that you are away from home when an emergency strikes, and/or if you have to abandon your car and walk a while to get to your destination. Preferably, in this case, it would be a bag that you would be able to reasonably carry, and would at least have water in it... If it is a scenario where you would need to walk, and your normal footwear is not the best for walking, you might want to have a pair of walking shoes in your trunk just in case as well. Happy New Year, and all the best wishes to you and yours for 2013! If the power goes out, and there are stores that are still open for business, it will be easier to buy things with cash than with a credit card, etc., and more ideal for everyone involved if you don't need anyone to make large amounts of change for you. And if the person you are purchasing things from doesn't have any change, you will overpay by much less if you are using smaller bills and/or change. Anyone care to share something I haven't mentioned in this series? It has never been meant to be all-encompassing, it has just been to help people think about what they could do to be additionally better prepared before the end of this year... only 2 more ABYs left! In any case, please enjoy your Saturday! If I could add anything to this, it would be: Clean water and some dental floss would be nice...We picked up some new toothbrushes and some small tubes of toothpaste for under $1.00 each at the store today--before tax. Did you get anything that helps with emergency preparedness for Christmas? Did you give anything that helps with emergency preparedness for Christmas? Hope everyone had a wonderful Christmas! If I could add anything to this, it would be: A system agreed upon where there is one person outside your area that everyone can contact so that all the people in your group can find out information about anyone/everyone in your group by calling the contact person who would (hopefully) not be affected by your emergency. Have a Merry Christmas, and all the best wishes to you and yours! If I could add anything to this, it would be: That's a hard question, since cleaning supplies are kind of all-encompassing. I didn't put particular supplies, since everyone has their personal preferences in this area. But cleaning supplies to clean whatever needs cleaning would be helpful. I'll leave it at that. Snowing here, so it looks like it will be a white Christmas in our area!!! Be safe, everyone! If I could add anything to this, it would be: The proper equipment (cans or buckets) to keep it fresh for a long time, and the knowledge of how to use it for different purposes (buttermilk, etc.). If I could add anything to this, it would be: This is a pretty big order, so I will leave it at that. Clothes, water, food, light, heat, etc. for 3 days is enough to keep anyone busy. My 44th ABY: Seasoning mixes, i.e. gravy, ranch dressing, taco seasoning, etc. If I could add anything to this, it would be: Knowledge on how to make these mixes from scratch, if I had to. Some things that I consider mixes are not really typical mixes, or could be used for their original purpose, other than just as flavoring--like Italian dressing packets, and ranch dressing packets, etc. But I do use them in cooking, and would miss them if I did not have them. What's your favorite kind of mix? If I could add anything to this, it would be: Good socks, and the chance to wear the footwear of choice for awhile before the emergency situation so that they would be comfortable already. You never know when you might have to evacuate on foot, or to a place that will make you wish that you had different shoes to wear. Even without evacuation, if the emergency at hand leaves a situation where you have to do major cleanup, it's a good idea to have protection for your feet. ABY #42: What's for dinner? If I could add anything to this, it would be: Everything that I would need to have in a car if I got stuck in any kind of weather, hot or cold. If you need to evacuate in a hurry, it would be really nice to have everything in the car already that would make it reliable transportation, and any kind of equipment that would help in a situation where it was suddenly unreliable (i.e. jumper cables, oil, jack, etc.) Not too long ago when we were on a trip we stopped to fill up and there was someone there with an Idaho license plate (not unlike ours :) and there was obviously a problem with the vehicle. My husband talked to him and found out that he needed oil for his car, so my husband reached into the back of our vehicle, pulled some out, and gave him a bottle. I don't know if it was enough to solve his problem, but he appreciated it. If I could add anything to this, it would be: A dehydrator, so I could make my own dried food... Yeah, that would be nice. Barring that, some dried fruit, jerky, nuts, and the like would be good to have in the storage. Just don't forget to store some water to wash a little o' this fruit and a little o' that jerky down, in case access to water is difficult to come by--sometimes in emergency situation, clean water is not easily obtained. If I could add anything to this, it would be: Reading material? Not much to say here, except that if your glasses break in an emergency situation, it might be hard to replace them. Also, if they are glasses that you only use at certain times (i.e. reading glasses) it might be a good idea to pack a pair in your 72-hour-kit, because in the stress of an evacuation situation it would be easy to forget to grab your regular pair on the way out. I could add anything to this, it would be: Knowledge and ability to mend and sew whatever needed mending and/or sewing. I don't recall at the moment if I have mentioned on this blog that sewing just isn't my favorite thing. I have a lot of work to do in this area. However, it would be good to know how to do the basics--sew on a button, mend a hem, take in and/or let out clothes as needed, etc., should an emergency arise where these skills were needed. This to me is one of those things that the least thing to be done is to have the materials you need on hand to perform the skill--then if the time comes that you need to practice it, you have something to practice with, and you may be able to find someone that will help you with the actual sewing even if they can't help you with the buttons, velcro, thread, etc. that is needed for the sewing/mending. If I could add anything to this, it would be: Oh, electricity, by a long shot... :) Be sure to have something that will entertain the people in your group--a card game, coloring books, books, etc. so that while you are waiting on the power to come back on/the roads to be cleared/name of problem to be solved here, things can be as pleasant as possible. Any other ideas for keeping people (especially young children) entertained in an emergency? Any other condiments that you plan on adding to your storage? A tent is not the only option for (hopefully) temporary shelter after an emergency, but it is a good one. What are your plans if you can't stay in your home? If I could add anything to this, it would be: Maybe a list like this one on some of the uses of vinegar--it really is a wonderful thing to have in storage. I'll ask the same question that I did for ABY #31 about honey: why would you store vinegar? Honey stays good indefinitely, and is a great addition to food storage. Just another one of the basics, really, when it comes to cooking with food storage, and it's very useful. Why would you store honey? If I could add anything to this, it would be: Some white flour, so I could mix the wheat flour with the white flour in baking and gradually go to all wheat flour if the situation merited it. You may want to check the comments under ABY #29, where someone was kind enough to list some internet and book sources on bread--like I often say, check the comments--it's worth it... :) Thanks kind anonymous person! ABY #29: Remember the little red hen? If I could add anything to this, it would be: Knowledge on the best way to use wheat, whether it was sprouting, grinding it into flour, using it for cereal, etc. I would much rather be the little red hen in that story than any of her "friends". There's a lot to learn about working with wheat, but the end result is worth it. What do you do with your wheat? If I could add anything to this, it would be: Info on how to use beans instead of oil, like that found here on TM Frugal Gourmet's blog, TM Preparedness. That is a page that is going in my emergency notebook! TM Frugal Gourmet has also left some great comments on my BY series that you might want to check out on my other blog--thanks, TM Frugal Gourmet! If I could add anything to this, it would be: Knowledge/information about the different kinds of salt. What I am referring to is just the table salt, but I know there are different kinds that are used for different things, so if anyone would care to add their expertise, it would be greatly appreciated. If I could add anything to this, it would be: Soda bottles full of clean, drinkable water. ABY number one was water for a reason--what other things would you store with your water to make an emergency easier to deal with? If I could add anything to this, it would be: You know what's coming....wait for it...... rice. Hence, with my 21st ABY, we have a pair. Rice is a different story. So are dried beans. But, oh how lovely they can be when you have the means to prepare them and a recipe that the people that you are responsible for actually like to eat. The BYs are great, and if you have power, you can add many of them to rice, etc. But what if your emergency is not a short one? What if the emergency is that trucking is delayed/your roads are unpassable/ food is unavailable due to drought/food prices rise, and you have to make your supplies stretch/name your long term emergency here? Beans are a great staple--and when you buy them dry, and in bulk, as well as rice in bulk, you get a lot more for your money than when you buy canned beans, or flavored packets of rice. However, starting from scratch does take more fuel and more water, so you have to plan accordingly. If I could add anything to this, it would be: Wow, where to start? :) When you add it to beans, it makes a complete protein, but you can also add it to soups, put soup over it, make a casserole with it, etc. ... Yeah, you gotta love rice. If I could add anything to this, it would be: Details (in an emergency notebook/binder/file, perhaps?) on the best way/time/location to plant the seeds stored, which plants don't grow well next to each other (heard a story the other day about a cucumber-squash that emerged in one garden, if memory serves) and the like. Of course, many times some details are included on the back of seed packets, but I would rather have too much information than too little.. And, ideally, it would be better practice and have gardened before an emergency, but you do what you have to. If I could add anything to this, it would be: The knowledge and ability to improve the soil available to improve whatever crop is being cultivated. Some people already have gardens, and some people have no room for a garden, so there are all types of situations. If you are one of those who don't have anywhere to put a garden, I am reminded of the idea that you can put potting soil in a bucket and grow something there. We do have a garden area, and save the leaves that blow hither and yon in our yard for compost. Feel free to comment about any ideas you have for your ABYs... would love to hear them! ABY #16: Water, water--oh, and did I mention water? If I could add anything else to this, it would be: Knowledge on how to care for such cookware, plus utensils that wouldn't say, melt, after the first or second use over a firepit/grill/woodstove. As this is the post that corresponds with Thanksgiving Day, Happy Thanksgiving everyone! All the best to you and yours! I mentioned on my other blog why I am blogging ahead--since that series is focused on food, it might be nice to go into the sales next week with a few ideas of emergency canned food to purchase--gotta love when you can get what you are looking for for a lower price. This series has a different focus, but I would really like to keep them going at basically the same rate. Oh, and if you have any suggestions for the BY series, please add your comment--you never know who you might end up helping.. If I could add anything else to this, it would be: A washboard, or some other type of device that would make washing clothes by hand easier. In an emergency situation where the power has gone out and you need to do laundry before your situation improves, it would be helpful to have an extra set of linens to use while yours are hanging in your laundry room and/or drying somewhere in the fresh air. By linens, I mean towels and washclothes, and possibly a spare sheet set for any beds you may need to change, and which might be difficult to get your hands on in the middle of an emergency situation. Drying clothes without a dryer takes quite a while sometimes, and you never know in what season you may be in when you need to use that clothesline or clothes rack. If I could add anything else to this, it would be: Water for flushing if the power is out, wet wipes/hand sanitizer, and an emergency toilet (bucket with seat and some of those stored garbage bags from ABY #8) if there is no access to regular facilities. There are other options (I've heard of using cloth, spray bottles, phone book pages, etc.) but hopefully in at least the immediate time following an emergency, you will not have to give up toilet paper if you have stored enough. Why would I put candles first? Well, I admit that everything I've listed so far is a light source, but it might be easier to find something to light candles with in an emergency than it would be to find new batteries for a flashlight if the emergency lasted for a lot longer than three days or so. Would love to hear anyone else's ABYs--hope you are having a great weekend! My 9th ABY: Gloves--for cleaning up messes and protecting your hands from germs, contamination, etc. If I could add anything else to this, it would be: Work gloves. The thin kind of gloves that you use for cleaning probably wouldn't last very long if you were trying to move debris and the like from your property. Even if your property isn't affected directly by a natural disaster, you might need such gloves to help others in need. 'According to the creator, Joshua Brown, "thousands of members of the Church of Jesus Christ of Latter-day Saints continue to volunteer to assist in the recovery efforts within these communities. On Sunday, November 11th, thousands of Mormons cancelled their church services and arrived by air, bus and train from all across the country to help. I really suggest that you go to the linked article, because under the video there are links to learn more about how to help. Really excellent post. Thanks, Prepared LDS Family! If I could add anything else to this, it would be: Return of sanitation department pick-up as soon as possible? That would be extremely advantageous after an emergency situation. Since that is not really something that I can add, I will say for the record that I would add gloves. Even if sanitation pick up is not disrupted after an emergency,you may find that you need any stored garbage bags you have for the protection/transportation/clean up of belongings before, during, or after an emergency. If I could add anything else to this, it would be: Hand warmers--hopefully more than I would actually need, in case some of them were defective and didn't work. If I could add anything else to this, it would be: Bar soap. I remember reading in a book about World War II that regular soap was scarce and appreciated. Hopefully not going to have to deal with a situation like that, but for a longer term emergency when trucking was halted or the like after a disaster, a little soap would be nice to have. Hope everyone is doing well with their ABYs! ABY #5: Need to do some non-traditional cooking? If I could add anything else to this, it would be: An alternative cooking device: grill, firepit, etc. Haven't seen many clothespins around here lately, so it's probably time to invest in some (more?) of those...enjoy the rest of your weekend! Recently I got a sliver in my foot, (little monster went right through my sock) and I was definitely grateful that we had a needle with which my husband could extract it. The placement was such that it would have been a definite struggle for me to try to extract it myself, and it took awhile to get it out. So, I'm thinking I should be sure that there are a couple of needles in any first aid kit that I put together, as well as means to disinfect said needles. I am also thinking that if you have medicine you need to take on a regular basis, you should try not to let your supply get too low, so that if for some reason there is a delay in refilling it, you'll be able to wait out any unexpected supply interruptions (trucking/transportation supply problems, etc.) without a problem. I'm also thinking that sunscreen would be a good addition to supplies--sunburn would be uncomfortable at best. The usual disclaimer--I'm not an expert, and everyone is responsible for their own choices when it comes to this or any matter on this blog or my other blog--including making sure the supplies you get are stored safely and properly. What are you thinking? Hope everyone is doing well--best wishes with any ABYs you're doing! If I could add anything to this, it would be: Several recipes with variations on a theme so I could make different kinds of breads, plus having already learned how to do at least one variation before an emergency. OK, series-long disclaimer here: I am going to be linking to recipes, ideas, etc. that are new to me in the course of this series. Since I am trying to do a post a day, there is no guarantee that I will have tried them before I post them, but they will be of the nature that I think that they would be handy, easy to do in an emergency, etc. I have not yet tried the following linked recipe. That said, this recipe for super easy survival bread looks pretty good, simple to make, and the author even gives you ideas on how to cook it if you have no power. Thanks, Be Survival! One recipe that I have tried is this one for tortillas. Thanks, Happy Housewife! How about you? Any easy recipes using only flour, oil, salt, and water? ABY #1: This blog and the other...are you in? On my other blog, I am posting a series on adding a can of food a day to storage between now and the first of the year. You can read more (and participate if you like) about it here. In brief, ABY is what I am using to refer to the phrase, "Additionally Better Prepared by the New Year", by using the first letters of the first two words and then the first letter the very last word of the phrase. On this blog, instead of focusing on canned goods, I plan to post daily between now and the end of the year (posts for Sunday will appear on Saturday or Monday) about ideas, recipes, additional items, etc. that I have found that will hopefully end up making me better prepared by the end of December. If I could add anything to this, it would be: More water. Ok, I am kidding, but only kind of. I think of all the difficulties that arise during emergencies, and having water to drink, cook with, and otherwise use would help with a lot of those problems. Storing water in clean soda pop bottles is an option if you don't want to buy the water already bottled. Pretty basic, but having water on hand can end up being crucial in an emergency. So, a challenge...what would you like to learn, acquire, practice, before the end of the year that would make you "additionally better prepared"? I would love to hear if you would like to share. You don't have to have a blog to share--just leave a comment here or a link to your ABY post on your blog in the comments so that others can benefit. Have you added anything to your emergency notebook lately? I finally started printing things off because there are a lot of things that would take a lot of time to write down, and I want it all in one place. So, soon to come: the emergency binder. ...we noticed that there were buds. And more buds. And peppers--actually lots of peppers, which hopefully come across in the picture above. Enough of a surprise, yes? For us, yes. Oh, but Peter wasn't done with the surprises. 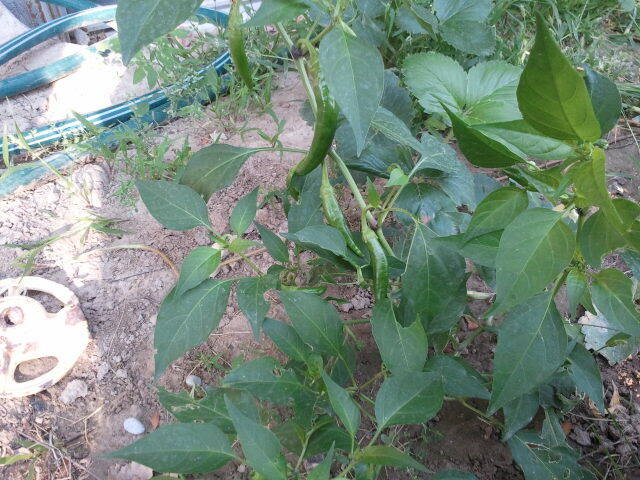 Turns out that Peter, who was sold to us as a jalapeno pepper plant, is not a jalapeno pepper plant at all. Turns out that Peter is a serrano pepper plant. And though I know next to nothing about serrano peppers, my understanding from people who would know is that serrano peppers are hotter than jalapeno peppers. So, it's all good. As long as I can tell when the peppers are ripe, which I have read online can be ripe when they are green or red, we'll have some good eating. So, I have to do more research before I begin harvesting. But hey, I have something to harvest. And that is something to celebrate. Hope you have had success (unexpected or otherwise) in your garden this year! If you would like a chance to win a free disaster preparedness pocket guide, you might want to head over to the Texas Preppers Network and leave a comment on this post. Gotta love preparedness, and it's even better if you can get more prepared for free... :) Thanks Texas Preppers Network! Have been watching for news concerning the fire burning near Pine and Featherville, and the most recent information I can find at the moment is the article here. According to the linked article, there are nine fires burning in Idaho right now, and it goes on to give more information on fires in other areas across the West. Situations like this always make me wonder just how prepared I am. Are my 72-hour kits really ready? Is there anything in my car, or that I would have with me that would help me deal with a situation like that the rafters mentioned in the above article experienced? Would I have enough in my storage to be able to avoid going out into the smoke involved (which is/has been a problem, and is mentioned in this older article) if necessary for health reasons? I have no problem giving Albertsons free publicity when they give me a great deal--thanks Albertsons! Well, not right now weather-wise, since it's kind of really really hot where we are, but in terms of food storage, it is. I never think of freezer storage as a huge option, because one of the emergencies I think of is losing power, and of course, in a scenerio including that, your freezer storage won't last very long. Or, say your refrigerator decides it doesn't want to cool up inside, but would rather start burning up its inner workings, like ours did last week. (True story. None of our refrigerator or freezer things was ruined, but we were lucky enough to get the early warning of it just not being its regular cold self, so we called out a professional who said that the whole thing would be more expensive to fix than to replace, so replace we had to--before it entirely died. If it had gone totally off, there may have been a different outcome...) Anyway, there may be some really good reasons to make part of your storage freezer storage, one of which I was reading about this week. You have probably heard about the drought situation--you can read more about it here, or here among other places. The prices on the crops will go up, of course, but here is an article that states that meat prices will go up as well. This would make sense, as the price to feed herds would go up, which is something I also read elsewhere (thanks to whomever mentioned it) and is not an idea original to me. Sooo, if you don't can meat, freezing it while it is still affordable and there is little chance of a power outage may be an option to be considered. You may even want to get an entire headstart on meals by not only freezing the meat, but putting it together with all the other items like vegetables and grains that will also most likely go up in price. A while back I found this link on the Our Best Bites blog, and talk about convenient! At the bottom of the post you will find a link to bring up an entire mini-cookbook for freezer meals! I have not yet tried these, and know which ones I am most likely to try. However,I don't know the preferences of the readers of this blog, so I will leave it to your perusal, and not bias you with my choices. Thanks, Our Best Bites! If you only came here for strictly preparedness purposes, you may want to skip the remainder of this post, although just about anything can be related to preparedness... :) Seems to me that I mentioned on one of my blogs that I don't try to be political on my blogs ( I should blog more often so that I could keep better track, huh? ) but I guess sometimes what I think is just plain American could be taken as political. I know that on this blog I have written about the importance of the 2nd Amendment, and the importance of upholding the Constitution. From what I understand, there is a Small Arms Treaty set to be signed a week from today, the aim of which is to take the 2nd Amendment (the right to bear arms) out of effect. The thing is, it won't go into effect unless it is ratified in the Senate. I have already called the Senators from Idaho, but it will take all of us working together to stop this. I was sent an e-mail with this link, explaining what this treaty would mean. On the video there, they ask for donations, etc., but that is not why I am providing the link. I am providing it because it begins by clearly explaining the situation. If you want to contact your state's Senators (Idaho's Senator Risch and Senator Crapo included, of course! :) the capitol switchboard number is 202-224-3121. Just give your Senator's name, and they will connect you... I, of course, hope that you will ask them to vote this treaty down, but it's a free country, for which I am unspeakably grateful. Whatever your opinion, make it known. 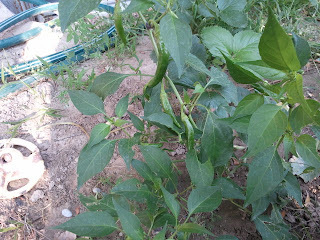 Oh, and I guess there is one more preparedness thing--Peter the pepper has continued to grow, but there is only the one pepper with lots of green leaves above it. Sad, but it is one more pepper than last year. Hope everyone's gardens are doing well! Unfortunately, there are more fires in the news, and this time it's closer to home. Our thoughts and prayers go out to those affected in the Pocatello area, as well as in other areas such as Colorado. I hope the fires are all contained and extinguished quickly. 2 cups of real buttermilk. Mix all dry ingredients well with your hands, slowly stir in buttermilk with a wooden spoon. Roll into a round ball and put a dish towel over it for about 45 minutes. This lets the soda & buttermilk mix together. Take a cast iron pot with a lid and dust it with flour. After the 45 minutes put the dough into the pot and press it down to about 2 inches thick with your fingers. Cut an X all the way through the top of the dough. Put the lid on it and put into a hot oven (45 degrees) for 30 minutes. Take the lid off and turn the oven down to 350 and bake another 15 minutes. As soon as you take it out of the oven, take it out of the pan. Or else it will stick. Cool the bread and don't eat it yet. Wrap it in foil for at least 6 hours. It needs this time to season. It really makes the difference in the taste. After at least 6 hours unwrap the bread and cut it into the 4 pieces from the x cut. Now slice your bread and put real butter on it. Nothing is better. No eggs, no suger, no yeast... Just real simple, great tasting and very filling bread. Really one piece with soup or stew and you are full for at least four hours!!! :) "
I love that this is made with basic ingredients, and also that there are specific instructions on how to make it with a cast iron pot. Thanks again, Polly! At any rate, I share this particular recipe not necessarily for the ingredients involved, but because of how difficult it turned out to be to make these enough to get the picture above, which we wanted for the aforementioned project. There are only two steps in terms of directions, so how hard could it be? Turns out: pretty hard, actually. This is not to say that this is not a good recipe--my husband really liked them, actually. This is to say that if I want a pancake recipe that has few ingredients and that makes wonderfully thin pancakes, thus hopefully making more pancakes to go around, I will have to practice a lot more than once to be able to make my ingredients stretch. It's hard not to imagine, when I am making a recipe that I think may be food storage friendly, how frustrated I would be if I had limited resources, little to no way to replace said resources, and hungry mouths to feed, and my recipe turned out the way this one did. "A button light is pretty simple. Take a small amount of oil and pour it into the bottom of a jar or other clear, glass container. Take an old button, preferrably metal or another material that won't melt. Thread a thin piece of cotton material through the button hole so that when left on it's own, the button holds the fabric straight up. It's recommended to not pull the cotton all the way through, just enough to form a lightable wick. Leave material on the other side of the button for both weight and to soak up the oil to the flame. Drop the button carefully into the oil (it helps to pre-soak the end of the wick you intend to light with a bit of oil) and then light the wick when you need to use the lamp. You can use almost any type of oil, I traditionally use olive oil or canola in a pinch. " I was very excited when I read this comment--thanks again, V! I usually don't talk about anything political on this blog, but I think this issue is so critical that I am now. Perhaps you have heard about the fact that a section of the healthcare legislation requires Catholics to act in ways that are contrary to their beliefs. I disagree that they should have to do that. Fortunately, according to an e-mail that I received yesterday, some people in Washington also disagree that they should have to do that (understandably, considering that they have sworn an oath to uphold the Constitution, and religious freedom is part of the Constitution) and the Blunt Conscience Protection Amendment will be voted on soon. Unfortunately, the timing of the vote is unclear, so time is of the essence for the phone calls to your senators. I consider this issue to be non-partisan, and want to protect our Constitution. The e-mail I received talked about a movement that Glenn Beck that has organized, and included the information that you can find here. If you go to the link, you will find out what you can do to stand up for religious freedom--in step-by-step detail. There is even a link so that you can find out who your congressmen are, and information in case you want to e-mail your representatives. If you already know all the information that you need to know, and just want to call the Capitol Switchboard, the number is (202) 224-3121. Ask to be connected to your representative, and they will put you through to that representative's office. Glenn Beck's campaign is called "We are all Catholics now". You may be familiar with the poem talked about here, where the basic idea is that when someone doesn't stand up for other people there are fewer and fewer people to stand up at all. We have to stand up for each other when it starts, so that we can stop it before it goes any farther. I'm not a Catholic, but I will stand up for their right to have religious freedom. I called my senators this morning asking them to support the Blunt Conscience Amendment. Sometimes we don't know what we can do when things that are obviously unconstitutional are paraded before us, but we can do something now, and quickly, before religious freedom is taken away. When enough people are willing to speak out, things happen. --I have only gotten to what amounts to the first page in wordpress, because it then gives you a chance to pick free, or to pay for your blog for $99/year. I ( probably along with 99.99999% of the blogging community) would prefer to have the free option, but there is a big difference (understandably) between what one is able to do when blogging free and when paying for it. So my first question is, when it says that with the free option that you don't have the "no ads" feature, does that mean that once you start blogging, random ads pop up on your page? That issue is my biggest concern--you may have noticed that I don't advertise (outside of links within the posts or on the blogroll, or when I find a reaaaallllly good deal and mention the business offering said good deal) on my blogs, and would prefer not to start now. I am not a professional, and am just trying to help others while I am trying to learn myself. --What is domain name and mapping, which is not included in the free package, but is included in the paid package? --If you have switched to wordpress, did you delete your original blog after importing the info? Seems like that would be the best option, but am wondering if others have kept both blogs, and then only added new posts to the newer blog. Granted, that is only on the sign-up page, and I may find that I have other questions later, but you have to start somewhere, right? Anyway, if you have any info to share, please do, and thanks in advance. On an Idaho water supply note, I have now heard from three people that despite our really weird (almost) no snow winter, there isn't really a threat of drought because there has been enough snow in the mountains to make it so that it's not an issue. I'm grateful for that! Blend wheat and milk in blender 2-3 minutes. Add another 1/2 cup milk. Blend another 2-3 minutes. Add 2 eggs and 1/2 cup oil (scant). Blend for about 1 minute. Pour from blender onto hot waffle iron. If you try them, hope you enjoy! So anyway, we headed on our merry way. The borrowed GPS we used is handy because you can feed in an address, and it will then give you directions to the desired location. It worked really well most of the time. It was the two times it, shall we say, "got confused" that showed that common sense plus previous research on a location is priceless regardless of how much technology you are working with. So, what's my point? I guess in this case, one point that can be made is that it is best to think of technology as being the back-up plan in an emergency. If we have technology (electricity, and all that comes with it, as an example) woo-hooo, (seriously) our lives will be that much easier. We just have to know what to do when the technology isn't working, electricity or no. What could we do if the things we do with technology were no longer available? For example, what about lighting? If you read my most recent post on my other blog, you will remember that one of the things that showed up as Christmas gifts were a couple of flashlights, to replace flashlights that had somehow disappeared from where they should have been. Those new (and older, truant flashlights) have a place to be so that they can be found when the lights go out. If the older truant flashlights had been unavailable during a blackout, we would have had to fumble our way to our candles and matches. And hopefully there would be daylight before we had to devise a plan C, if necessary. Technology is great, but sometimes fails, and common sense and ingenuity can come to the rescue if necessary. Having somewhat recently reread The Long Winter by Laura Ingalls Wilder, I am intrigued by the "button light", I believe it was called, that Ma made when they ran out of other means of lighting. It involved a button, a piece of cloth, and some oil...if anyone already knows how to make this, please share. In any case, I will most likely look up how one is made, because I loved the ingenuity of it. When the family ran out of fuel, they made sticks of hay to burn, the method for which is also described in the book. The sticks burned quickly, but they kept the family alive.